11 Feb 2019 --- Advances in robotics are facilitating ever-increasing speed and efficiency in packaging automation. Robots are able to perform menial, repetitive functions with far higher productivity than humans, allowing personnel to focus on higher value tasks. As the global population and levels of consumption continue to rise, robotics will be an increasingly significant factor in meeting the growing demand for packaged goods. 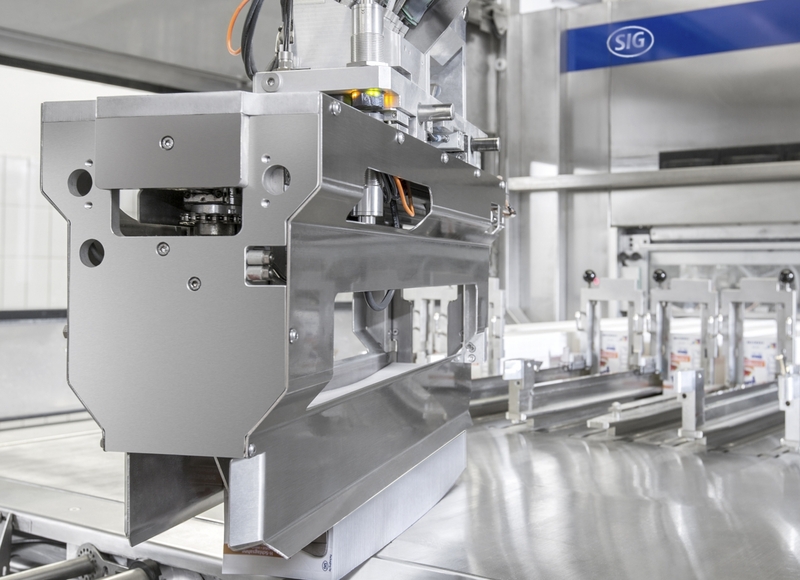 Aseptic carton packagers, SIG, recognizes the potential of robotics in optimizing the speed and efficiency of processing. The company already integrates robotics into its filling lines. Click to EnlargeThe R-CAM loads the filling machine with carton sleeves fully automatically, creating real gains in terms of the efficiency of workflows and reducing the amount of manual work (SIG).Food and beverage manufacturers who operate SIG filling machines receive the carton sleeves in shipping boxes on pallets. Without using the R-CAM, the shipping boxes have to be removed from the pallet and loaded into the filling machine’s magazine by hand. With the SIG Robotic Magazine, shipping boxes are removed from the pallet and opened, and the filling machine is loaded with carton sleeves in a fully automated process. This process does not require any action from the machine operator, Mergel notes. “The robotic magazine consists of two parts: a pallet magazine and an unpacking station. The pallet magazine offers space for a Euro pallet, industrial pallet or Australian pallet. Once the pallet is inside the magazine, a scanner reads the pallet pattern to detect how the shipping boxes are loaded on the pallet,” Mergel explains. “The gripper arm moves the shipping box to the unpacking station. The robotic magazine includes an internal buffer to ensure that production can continue to run smoothly even while a new pallet is being loaded into the pallet magazine. This buffer can hold up to 20 shipping boxes of carton sleeves,” he adds. Another pioneering company in robotic automation, Schubert, integrates robotics into each of its TLM-Packaging Machines. Above all, they are designed to increase the flexibility, efficiency and reliability of food processing. “The particular advantages of our packaging machines lie in the machines’ modular system design and the ability to individually determine their scope of performance and tailor it to the customer’s needs. 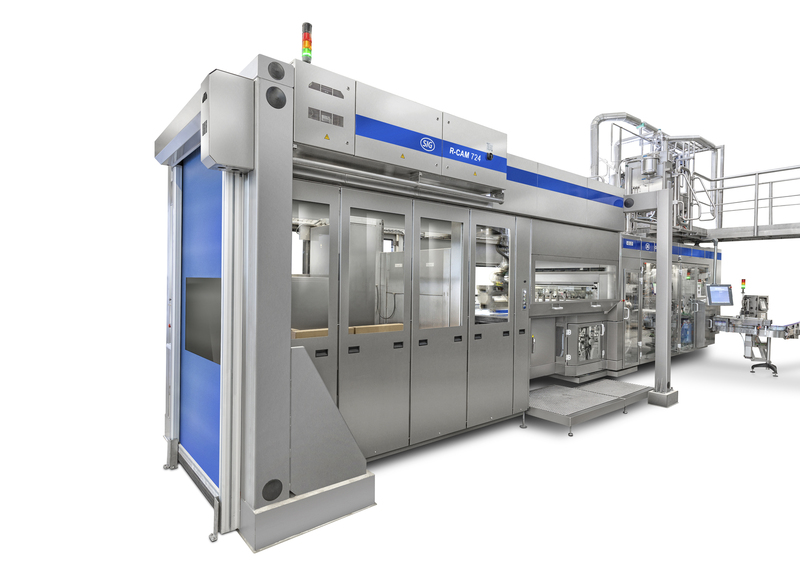 Eight standardized, highly flexible system components are combined into a robot-supported packaging system in accordance with the modular principle,” Ralph Schubert, Managing Director, Schubert, tells PackagingInsights. “Our robots offer a high degree of flexibility and repetition accuracy. Moreover, extremely high speeds can be realized with our robots,” he adds. For example, Schubert’s F4 arm can accelerate with 10G, reaching speeds of up to 4.7 m/s with a noise level of only 70 dB. F4 robots can be programmed to work together as a team and mutually pursue filling objectives. Schubert’s Transmodul is the “world’s first transport robot for packaging machines.” It has an inductive power supply which allows the Transmodul to move freely. Data and signals are transmitted wirelessly. To hold cartons and products in place during transport, the Transmodul is equipped with a vacuum blower that generates a vacuum of 0.04 bar. The maximum acceleration is 3G. This allows it to reach speeds of up to 4.5 m/s. Click to EnlargeThe spring-loaded grippers carefully place the croissants onto the Transmodul in a registered location so they do not slip while being filled by the needle. To compensate for any fluctuations, the needles can be adjusted in height and depth (Schubert). 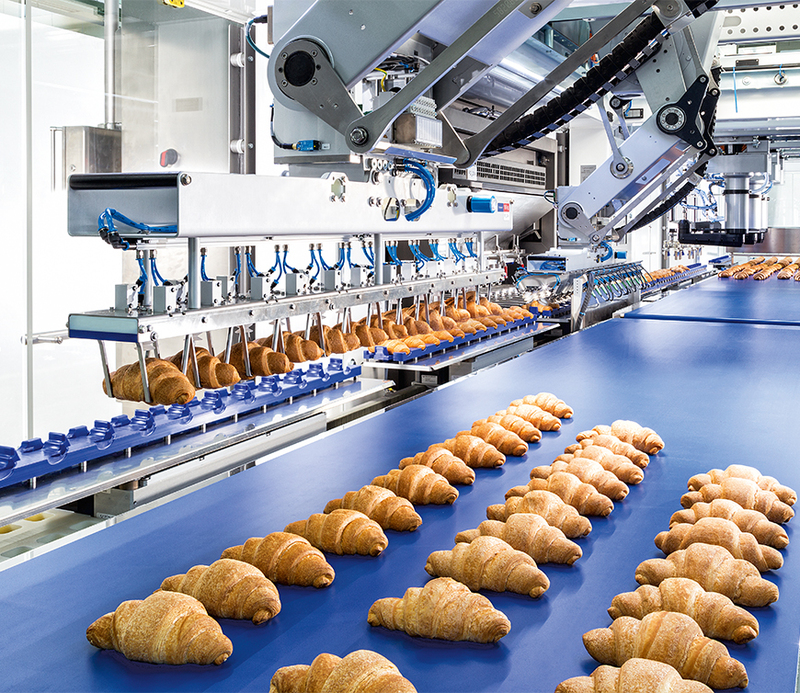 Schubert has aided Italian, family-owned company, San Giorgio Dolce & Salato, in its ambitions to be the first manufacturer to introduce pre-baked, filled and frozen croissants to the gastronomic market, with a purpose-built automated processing system. Schubert’s system gently injects different fillings into the baked goods and efficiently combines this operation with the final packaging process via sophisticated pick-and-place robots attached with gentle grippers. Thanks to this automation solution, San Giorgio Dolce & Salato can fill and package 160 croissants per minute. Family-owned The Wilkinson Baking Company unveiled The BreadBot – the world’s first fully automated bread making machine – at the Consumer Electronics Show 2019 in Las Vegas (CES) last month. The BreadBot turns flour into loaves, producing bread which is fresh, healthy, preservative-free and eco-friendly in comparison to center aisle bread. The system is aimed at re-establishing an “emotional connection with the shopper” that has been lost in an age of industrial food production. “Believe it or not, the last time there was a major innovation in the way bread was made was 1912, with sliced bread,” Randall Wilkinson, CEO of The Wilkinson Baking Company, tells PackagingInsights. “In the age of home delivery, the BreadBot attracts consumers back to the store. Consumers want fresh, delicious bread that is produced with theater and engagement,” he says. “The commercial bread category at retail has, for many years, been stagnant if not declining. Yet, with the announcement of the BreadBot at CES 2019, social media exploded with interest in the BreadBot. We believe this reflects the pent up demand for fresh, tasty bread,” adds Wilkinson. The BreadBot mixes, forms, proofs, bakes and cools ten loaves of bread per hour – all on its own – and is capable of making most varieties of bread that require dry ingredients. This includes white, wheat, whole wheat, nine grain, sourdough and honey oat. Produces 10 loaves per hour. Time to first completed loaf is 90 minutes. New loaves produced every six minutes. Operates up to a 24-hour duty cycle. Yields a maximum of 235 loaves per day. Requires about 30 minutes for daily cleaning. 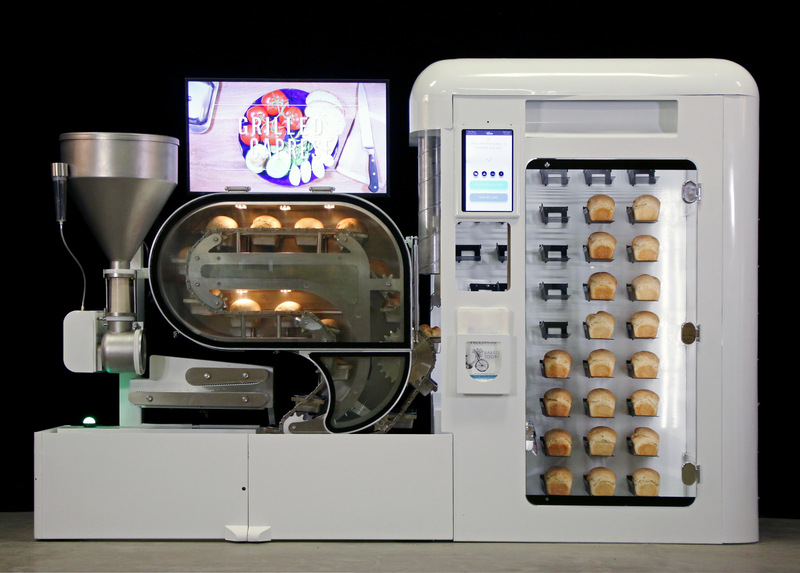 Most food providers – including grocery stores, convenience stores and schools – can benefit from the compact 22-square-foot BreadBot, which is “more automated than a US$75 million bread factory,” the company says. Robotics are sometimes feared as a technology that will put people out of work, but some argue it could actually benefit work satisfaction and increase the need for technical knowledge. Click to EnlargeThe BreadBot developers believe that retailers' bread sales can increase by 30 percent using this fully automated machine. SIG’s R-CAM creates more efficient workflows and, in doing so, reduces manual work hours and physical strain on the staff. “It allows them to concentrate on higher-value tasks instead of dealing with pallets, containers and loading jobs,” Mergel explains. “The R-CAM from SIG is a good example to demonstrate that the robot application never gets tired compared to humans and can, therefore, carry out repetitive tasks without errors. However, people are becoming increasingly important in monitoring and maintaining robotics, which are highly complex mechatronic systems,” he says. Like Mergel, the Shubert spokesperson believes that robots’ ability to perform monotonous work tasks will enable employees to enjoy more sophisticated functions, such as programming and maintenance. As computers and robots become increasingly intelligent, collaborative and cooperative robots – cobots – are being developed to enhance new automation and further alleviate work tasks. Cobots are industrial robots that function without a safety area, capable of carrying out simple tasks. “Schubert’s cobot is fast and does not require guard doors. It slows down when people get close to it and stops safely before coming into contact with people. This makes it a cooperative robot in fact, rather than a collaborative robot,” Schubert adds. Click to EnlargeThe SIG Robotic Magazine is fully automated. The shipping boxes are removed from the pallet and opened and the filling machine is loaded with carton sleeves. Another step forward in building fully-automated filling lines involves automated guided vehicles (AGV), which can transport packaging pallets and materials from a central store to the R-CAM. At the same time, SIG recognizes AGV as a significant next step in packaging robotics and automation. They can transport packaging pallets and materials from a central store to the R-CAM, Mergel notes. 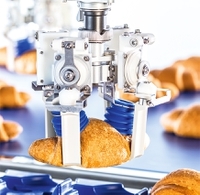 According to Schubert, food, confectionery, dairy, bakery, beverage as well as pharmaceutical, cosmetics and technical products are all currently benefiting from robotics in automation, in terms of increased speed and inefficiency.